French goalkeeper who joined Tottenham Hotspur in 2012 after four years with Lyon and three years with Nice. He was named Ligue 1 Goalkeeper of the Year three consecutive years with Lyon and became a member of the French national team in 2008. He helped France win the World Cup in 2018. He began his youth career with Nice at age 11. He led his French team to a UEFA European Under-19 Football Championship in 2005. He was born in Nice, France and grew up alongside his younger brother, Gautier Lloris, a fellow soccer player. In 2010, he welcomed a daughter. 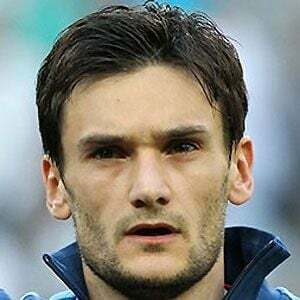 He married Marine Lloris in 2012. He became teammates with Aaron Lennon on Tottenham Hotspur in 2012.